It's travelled hundreds of miles through outer space, but from today the spacecraft used by Tim Peake will be on display here at London's Science Museum. The astronaut, who made history by becoming the first from the UK to do a spacewalk, hopes the exhibit will inspire the next generation. If you missed the chance to see King Richard III's burial yesterday - you can still see his skeleton here in London. A 3D printed replica has gone on display at the Science Museum. It's so accurate you can even see the battle wounds in his skull that killed him. 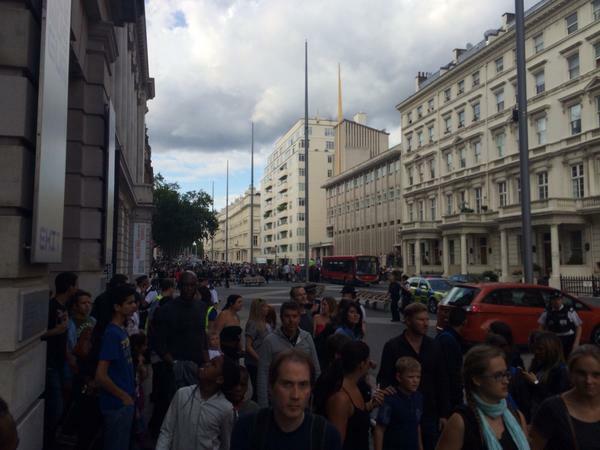 The Science Museum has been evacuated after a suspicious package was found. Just got evacuated from the Science Museum in London, police everywhere! James Lovelock, the 94 year old scientist described as 'one of the most important independent scientists of the twentieth century', will see his work honoured in an exhibition opening today at the Science Museum. The exhibition uncovers achievements from throughout his seventy year career, which saw him work on fields as diverse as medicine, space exploration an environmental science. The Nobel winning scientist who discovered the existence of the 'godparticle' will open a new exhibition at the Science Museum today. Professor Peter Higgs will tour the new one million pound"Collider" exhibition - the most ambitious exhibition at the museum to date. The exhibition will be devoted to the Large Hadron Collider (LHC), the giant atom smashing machine based at the CERN laboratory in Switzerland, which confirmed the particle's existence last year. The Museum hopes to recreate what life is like at the particlephysics laboratory near Geneva. A portable foot shower designed by an 11-year-old from St Albans has won the Science Museum's summer invention competition. Sophia Laycock's 'Pediclean' washes the sand off your feet when you've been on the beach. She beat over 60 entries to win a 3D printer worth £2,000. The device consists of a plastic bottle which attaches to a pipe and when squeezed, dispenses a spray of water onto the feet which are placed on a platform. It's designed to be light-weight and easy to transport while on holiday. Sophia said: "I'm really thrilled to win this competition. I've seen foot showers at beaches whilst on holiday, but never seen anything like that in Britain. The 'Pediclean' is just a simple way of cleaning sand off your feet so the sand stays at the beach and doesn't get in the car!" Mark Champkins, Science Museum Inventor in Residence said: "This product is an ingenious solution to one of the most irritating problems experienced on a trip to the beach." The 'Pediclean' is a smart and simple design that I can imagine in the shops." As you put the clocks back this weekend, spare a thought for the Science Museum as British Summer Time ends. The museum has to wind back around 500 clocks by 2am on Sunday. The change means darker evenings and an extra hour of daylight in the morning. Some MPs are still calling for an end to putting clocks back, calling it a "flawed ritual of plunging the UK into darkness by mid-afternoon". Children urged to invent "improvements to British summer"
The Science Museum is keeping young minds occupied by asking children to come up with an invention to help improve the British Summer. And, unsurprisingly, they're not short of suggestions. As Martin Stew has been finding out.